Sydney has a very egalitarian attitude to opera. Far from being a bastion of snooty elitism, the Sydney Opera House seems to be a rocking local/tourist hangout, filled to the brim, of a fine winter's evening, with chattering crowds hanging out at the harbourside bars just under the iconic sails. The slightly more formally dressed opera crowd mingle quite cheerfully with the beer-swilling, jeans-wearing tourists. It's all pleasingly eclectic, its air of good-humoured relaxation exemplified neatly by our waiter, who had about seven inverted wineglasses slung through the belt on the back of his waistcoat. 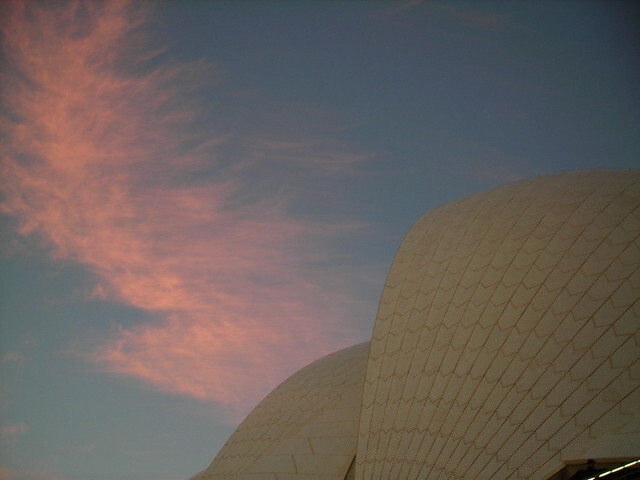 When you approach the opera house by ferry the silhouette, by now the stuff of cliché, looks all ethereal and floaty, like the pictures. One puff of wind and you expect to see the whole thing up sticks and drift out to sea with a stately grace, like a Spanish galleon. Up close, and particularly inside, though, the thing has a sort of a brutal feel, all giant soaring concrete arches and stone, solidly rooted to its peninsula. It's an amazing space, and an amazing history of construction, rife with visions, personalities, cost overruns and hair-tearing moments of "this thing can't be built!" The act of faith to keep going was something extraordinary. 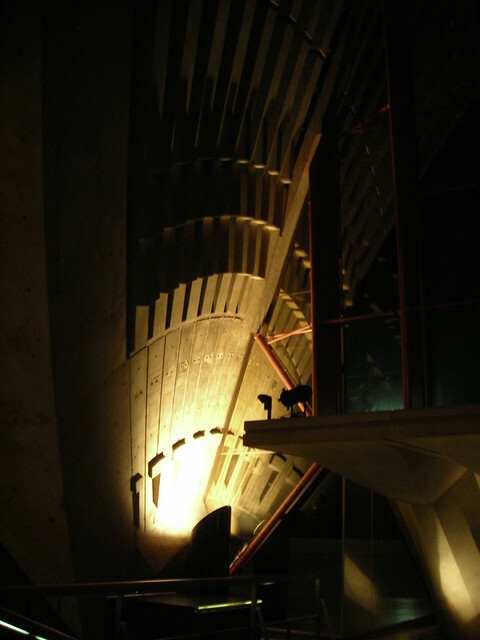 The internal theatre and concert spaces are also extraordinary - beautifully designed, and very neatly finangled to give the necessary wing and set storage space under rather than next to them, as dictated by the strange shapes of the external shell. (We took the guided tour, it was fascinating). The opera itself was a bit weird as an experience; it transpires that I was the only serious opera buff in the group of colleagues who went, and half of them got bored and left at intermission. Cappriccio is a bit of an unfortunate introduction to opera, being an extremely cerebral and meta-level exploration of whether words or music are more important as art forms, but it's frequently witty and the music, while a bit vague and formless at times, has moments of enormous beauty. However, the colleague who booked managed to get us into cheap seats where we couldn't actually see the surtitle strip, which means that we only really had access to half of the words/music debate, rendering it one-sided and curiously moot. It was beautifully staged and sung, though, and I'm utterly glad I went. In other news, this lurgi is at the well-known "almost accidentally faint while looking at dugong" stage. I need to stay off my feet for a few days. On the upside, I also met a platypus. I haven't watched ballet for a number of years, as my fairly thorough habituation to opera was spiking the balletic enjoyment guns - I kept waiting for all these impossibly thin people with the steel and rubber legs to open their mouths and start with the singing. Nothing like over-immersion in completely the wrong set of stylized communication codes. However, old age is apparently mellowing me and I leaped at the chance of a random free ticket to Giselle on Sunday. I enjoy ballet, I really do, but it's a dashed contradictory artistic experience. On the one hand it's pure magic: beautiful shapes, limbs in beautiful attitudes, bodies moving in graceful, co-ordinated patterns, and, this being Giselle, lots of white net and amazing misty forests at night, with gravestones. But basically, muscular, scarily co-ordinated, very hard-working people are setting out with maximum effort to persuade you that, in defiance of physics, people actually are lighter than air. Ballet is an illusion. It doesn't just disguise its own effort, it also disguises the anorexia, bleeding feet, psychotic training routines and savage body image problems which underly the effort. At least opera singers are (a) clearly working their butts off when they sing, and (b) frequently overweight. I also think my exposure to opera has wrecked me for classical balletic mime (of which there is a lot in Giselle). After the nuance and suggestiveness of the vocal, mime is horribly like SHOUTING THE POINT unecessarily, again and again, in words of one syllable, which are anyway reiterating what the music has just said. An awful lot of Giselle comes down to some variation on "I love you! let's dance!". All of which being said, don't for a moment think I didn't love the ballet. It's one of my favourites, being basically as Goth as all get-out: beautiful village girl discovers that lover is an Aristocrat who is Just Trifling With Her Affections; she goes mad, dies. Rises as ghost to join a corps of undead vampiric maidens crossed in love and dressed in white. They entrap men and make them dance until they die of exhaustion. Except for Aristocrat, who is forgiven and escapes when the vampire maidens return to their graves at dawn. Giselle herself, when you get down to it, is a bit of a feeb, but the vampire maidens are wicked cool. I love opera dearly: it satisfies not only my low, reprehensible passion for unashamedly emotional music, but my equally low, reprehensible passion for stylised narrative and symbolic wossnames. Last night's La Boheme was unfortunately a rather scrappy production, dogged by a chorus all over the place, a leading lady with the body language of a scoop of mashed potatoes, a subtitle machine which apparently succumbed to the Windows Blue Screen Of Death halfway through the first act, and a general orchestra/singer balance problem which caused exactly the same problem I experience in local live band music, viz. a desire to hunt down the sound mixer, slay the operator by bashing him to death with a handy Goth, and stage a major intervention to get the bloody instrument/voice balance right, dammit. Opera singers should know how to project their voices, but there was a weird acoustic on the stage which rendered the orchestra's performance at volume 10 and the singers' at 5. Especially the tenor, who was a curiously undynamic stage presence despite overall acting competence and a lovely voice. And you know what? It didn't really matter. Regardless of the irritations of the production, there were still moments, many of them, where the sheer beauty of the music and the voices of the singers transcended the minor irritations of the production. Part of this is Puccini's music, which is at times soaring, sensitive and unashamedly emotional, the perfect companion to a libretto mostly about feeling and very little about action. What the music does, though, is to pull in not only the audience, but the singers, so that the overall scrappiness of the production would, for a minute or two, suddenly and magically cohere. I forgive absolutely everything, even the solecisms of the on-stage trumpeter who lost it in a shower of squawks halfway through a fanfare, because of the last five minutes, the musically beautiful and tragic death of Mimi, when the singers suddenly woke up to the emotional import of the scene and became inspired. Opera isn't opera unless it's milking the music for all it's worth in order to grab your guts in both hands and twist. Other than scoring a random opera attendance courtesy of starmadeshadow and her parents, it's been a somewhat irritating weekend. It's been raining buckets, off and on, and while driving on Friday night I managed to plough through an unexpected puddle deep enough to have done something 'orrible to the engine - my poor little Mermaid currently refuses to start, turning over gamely but making a curious gasping noise instead of catching. I diagnose water in the wossnames. I should have expected something drastic when the electric gate stopped working earlier in the week. Damned techno-jinx.